Preface. List of contributors. 1. General Overview, Trends and Prospects (A.J. Burggraaf, L. Cot). 2. Important Characteristics of Inorganic Membranes (A.J. Burggraaf). 3. Adsorption Phenomena in Membrane Systems (Y.H. Ma). 4. Methods for the Characterisation of Porous Structure in Membrane Materials (A. Julbe, J.D.F. Ramsay). 5. Ceramic Processing Techniques of Support Systems for Membranes Synthesis (A. Larbot). 6. Preparation of Asymmetric Ceramic Membrane Supports by Dip-coating (B.C. Bonekamp). 7. Sol-Gel Chemistry and its Application to Porous Membrane Processing (C. Guizard). 8. Fundamentals of Membrane Top-Layer Synthesis and Processing (A.J. Burggraaf). 9. Transport and Separation Properties of Membranes with Gases and Vapours (A.J. Burggraaf). 10. Dense Ceramic Membranes for Oxygen Separation (H.J.M. Bouwmeester, A.J. Burggraaf). 11. Current Developments and Future Research in Catalytic Membrane Reactors (J. Sanchez, T.T. Tsotsis). 12. Transport and Fouling Phenomena in Liquid Phase Separation with Inorganic and Hybrid Membranes (C. Guizard, G. Rios). 13. Applications of Ceramic Membranes in Liquid Filtration (C.A.M. Siskens). 14. Feasibility of the Application of Porous Inorganic Gas Separation Membranes in some Large-Scale Chemical Processes (H.M. van Veen, M. Bracht, E. Hamoen, P.T. Alderliesten). Subject Index. Inorganic membrane science and technology is a new field of membrane separation technology which until recently was dominated by the earlier field of polymer membranes. Currently the subject is undergoing rapid development and innovation. 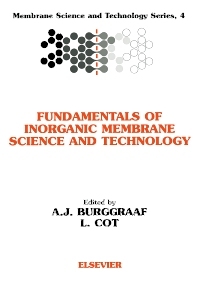 The present book describes the fundamental principles of both synthesis of inorganic membranes and membrane supports and also the associated phenomena of transport and separation in a semi-quantitative form. - Potential areas for future innovation are indicated. By combining aspects of both the science and technology of inorganic membranes this book serves as a useful source of information for scientists and engineers working in this field. It also provides some observations of important investigators who have contributed to the development of this subject.